Custom Photo Frisbees Personalized in Full Color. Cheap, Promotional. Budget Prices in USA and Canada. 9" Diameter. Bulk Custom Photo Frisbees at an unbeatable price. Your custom imprint is done directly on the Plastic Frisbee, in high resolution. Lowest prices in the USA and Canada for custom photo frisbees . Our lightweight, 9 in. full color frisbees are great for children and adults alike, and for advertising during outdoor events. 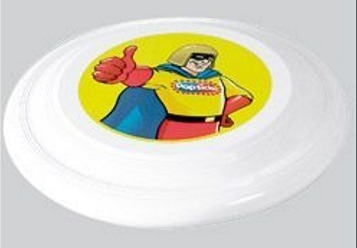 The wholesale full color frisbees are made of sturdy polypropylene plastic. Free artwork design. We will send you a proof for your approval before production. American clients pay no taxes. Set Up Charge: $95.00 per order. Less Than Minimum: Absolute Minimum is 50 Percent of listed minimum with a $50.00 less than minimum charge. Production Time: 5-7 days after art approval; Rush production available: contact us. Absolute Minimum: 500 pieces with $50.00 LTM (Less THan Minimum Charge).